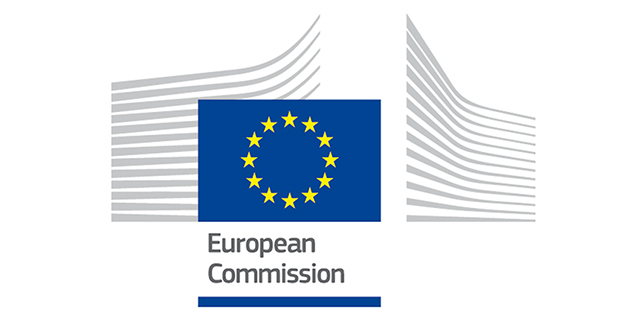 Secondments: Siemens, Germany and TNO, The Netherlands. the stability of interconnected systems. 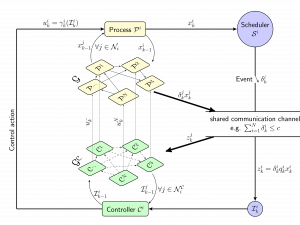 event-triggered control and scheduling of multiple event-triggered loops, aiming to reduce expensive and time-consuming information exchange between control loops.
. The result of this investigation will be a guideline for finding easy and fast solutions to the event-triggered optimal control of interconnected systems. In a second step, we investigate the problem of optimal control subject to communication constraints. The main question then is to find an appropriate distributed control, which minimizes the control cost subject to the communication constraints (i.e., or a trade-off between the expected control cost and the expected communication cost). The obtained results on optimal information pattern and separation for tractability of the solution will guide the search as a starting point. This creates the theoretical foundation for the co-design of distributed control and communication architectures. Successively, we will work on the distributed structure of the controllers and scheduling laws to guarantee efficiency, scalability and flexibility. Exploit the hybrid nature of event-triggered and time-periodic measurement information. combined stochastic and set-membership information filtering in multi-sensor systems. Moreover, we will develop some rudimentary simulation framework. Embed the analysis and control synthesis tools into a toolbox control and validation of the methodologies. The continuing evolution of physically complex and distributed systems requires the allocation of energy and computational resources in an efficient manner. These requirements depend on the application as there might be some constraints on the information sharing between subsystems, for example, due to limits imposed by communication. Key challenge and innovation is the joint consideration of physical and cyber-constraints. The physical constraints are due to the physical coupling in large-scale interconnected systems, where the subsystem’s dynamics influence each other on the physical level. The cyber-constraints result from limited resources such as communication and computation. a shared communication channel between all agents of the network (capacity constraints or minimization of expected communication cost). We aim to develop a framework for the (joint) design of distributed control and scheduling laws, which guarantee efficiency, scalability, and flexibility. We will derive stochastic stability and convergence conditions for the overall system using drift criteria and Lyapunov-type analysis tools. Important aspects include the distributed and decentralized implementation of the protocols/controls and the potential for easy reconfigurability of the overall system. We will investigate the trade-offs between implementation complexity, platform specifications, and achievable control performance, which eventually leads to architectural guidelines for the design of large-scale cyber-physical systems. The developed analysis and control synthesis tools will be embedded into a toolbox for real-time control and protocol design, which will be further developed, tested and validated with the academic and industrial partners within the ITN. MATLAB/Simulink: software and graphical modelling environment used for simulations and analysis of concepts and ideas before trying to obtain analytical proofs. ROS: Physical experimental set-up where we plan to apply optimal control and/or trajectory tracking while keeping the communication overhead to minimum through an appropriate scheduling policy. Astrom, K. J., & Bernhardsson, B. M. (2002, December). Comparison of Riemann and Lebesgue sampling for first order stochastic systems. In Decision and Control, 2002, Proceedings of the 41st IEEE Conference on (Vol. 2, pp. 2011-2016). IEEE. Bar-Shalom, Yaakov, and Edison Tse. “Dual effect, certainty equivalence, and separation in stochastic control.” IEEE Transactions on Automatic Control 19.5 (1974): 494-500. Heemels, W. P. M. H., Johansson, K. H., & Tabuada, P. (2012, December). An introduction to event-triggered and self-triggered control. In Decision and Control (CDC), 2012 IEEE 51st Annual Conference on (pp. 3270-3285). IEEE. Molin, A., & Hirche, S. (2013). On the optimality of certainty equivalence for event-triggered control systems. IEEE Transactions on Automatic Control, 58(2), 470-474. Ramesh, C., Sandberg, H., Bao, L., & Johansson, K. H. (2011, June). On the dual effect in state-based scheduling of networked control systems. In American Control Conference (ACC), 2011 (pp. 2216-2221). IEEE. Ugo Abara, P., Hirche, S. (2017). “Separation in Coupled Event-Triggered Networked Control Systems”. International Federation of Automatic Control (IFAC) World Congress 2017. Witsenhausen, Hans S. “A counterexample in stochastic optimum control.” SIAM Journal on Control 6.1 (1968): 131-147.